Word founded Myrrh in 1972, and Hearn was there as the label's A&R man, signing new artists. 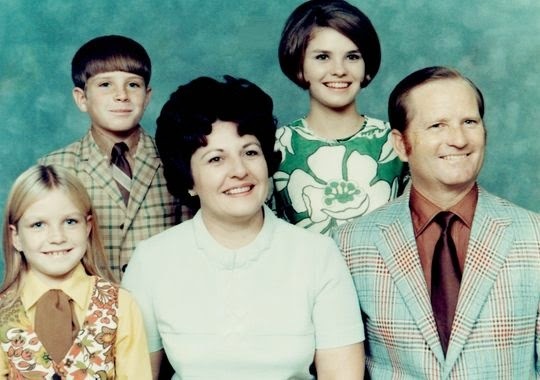 Billy Ray Hearn, right, with his family in the 1960s. Hearn was a Southern Baptist music minister at the time. As the Jesus People Movement was catching national attention and -- maybe more importantly -- the imagination of evangelicals across the country, Hearn was signing Jesus People up to produce records. The new converts, still stylistically embracing much of "hippie" culture, seemed to have the language to reach young people with the Gospel. "Jesus was the answer to their search for the meaning of life so they wrote music to express their newfound faith," Hearn told Robert Darden, author of Corporate Giants: Personal Stories of Faith and Finance. "We were taking the gospel message to the current culture in their style of music." At the same time, baptizing rock music made it suitable for Christian youth groups and evangelical church kids. As Larry Eskridge writes in his history of the Jesus People, the movement that started as a religious offshoot of the 1960s counterculture quickly became "an attractive mass identity suitable for a large segment of the children of Nixon's silent majority." The new market was a wide-open business opportunity. And Hearn was there, making Jesus Music into a consumer product. He signed Randy Matthews, Barry McGuire, Honeytree, and The 2nd Chapter of Acts. Production budgets were in the range of $10,000, according to Eskridge. Distributed through a network of about 700 Christian bookstores, Myrrh could sell about 50,000 albums. That less than the average break-even point of a mainstream commercial record, but a sizable number nonetheless. A hit, like The 2nd Chapter of Acts's "Easter Song," could even get radio play. Within two years, Myrrh was doing more than $2 million of business annually. The money, of course, changed things. "The label and I both slipped into a more commercial attitude and sometimes began producing product for the wrong reasons," Hearn said. "This caused me to want to 'start over' and do it on my own and do it right." Hearn left Myrrh to start a new label, Sparrow Records, in 1976. Though he said he wasn't in it for the money, it was also important to be profitable. And he was. Within a year, the company was valued at $250,000. Hearn's biggest asset was his eye for talent, according to the Encyclopedia of American Gospel Music. He took several artists with him from Word and signed some new talent as well. In Canoga Park, Calif., the new label had a short list of artists who would become the who's who of Contemporary Christian Music. At Sparrow, the motto was "Quality Contemporary Christian Music by artists who lived the life they were singing about." It was, nonetheless, an amateur affair at the start. Hearn later recalled that he knew very little about the business of music, not even how to do a balance sheet. The label did not have a set policy on how royalties would be paid. Hearn thought it was enough the company be "totally honest and Christian." The money behind the project quickly intervened, however, and Hearn got a crash course in the business side of things. He was soon surrounded by Christian business men: a born-again corporate lawyer, a born-again business lawyer, a born-again accountant, and various born-again consultants and mentors, including Gene Holloway, a Florida restaurateur who later faked his own death in a life-insurance scam. The business of evangelical culture was unusual, though, because it was also always a ministry for those involved. This could present Hearn with real challenges. His best-selling artist in the early days of Sparrow Records, for example, was Keith Green. A young convert in Southern California committed to giving his whole life to the Gospel, Green decided it was wrong to sell the Gospel. He wanted to give away his albums. Hearn declined to give the very popular records away for free, but did release Green from his contract. For some Christian musicians, Hearn was the man who wanted them to sell out. "Some of our artists and employees thought that we should be like a church," Hearn wrote. "My concept of Sparrow Records was that it was NOT a 'ministry' to the people ... We provided a good record company as the platform from which the artists could launch their ministry. We were not a church. We strived to be a good business run by Christians based on Christian principles and ethics." Some musicians agreed with this. To them, Hearn's business sense was what made their ministry possible. Michael Card, for instance, told Christianity Today that he would have given up on music if Hearn hadn't helped him out of a nasty contract dispute with another label and given him the backing to continue in a new direction. John Michael Talbott called the label-owner a life-long friend. By 1989, Sparrow Records was bringing in $20 million a year in sales at 3,000 Christian bookstores across the country. Being a business and making business decisions also meant the company was changing with the times. The late 1980s and early 1990s also saw Hearn diversifying, selling more than music to the subculture he had helped create. The music label made a lot of money at the time from aerobic work-out videos "for today's yuppified, health-conscious evangelicals," as the LA Times reported. The most popular of these was "Stormie Omartian's First Step Workout Video," which sold more than 100,000 copies. Hearn then moved Sparrow Records -- and more than 70 families -- from Southern California to Nashville, Tenn., in 1991. The company was valued at $35 million. He sold it to EMI, a secular corporation, the following year. 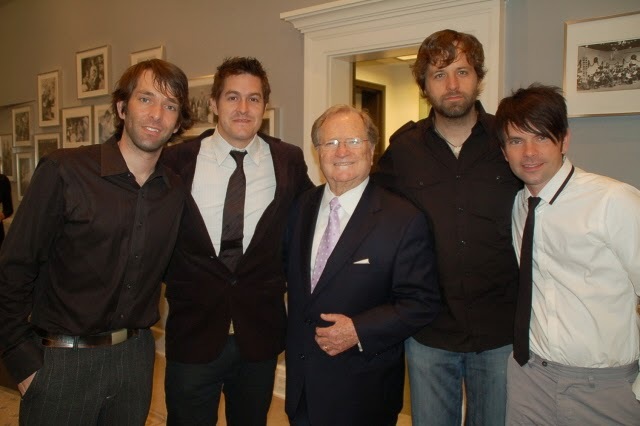 Hearn was named head of EMI's Christian Music Group as part of the deal, a deal that made him CEO of the largest Christian music corporation in the world. He helped EMI CMG dominate the Christian music charts in the 1990s, before suffering from heart problems and going into retirement in 1996. When his son Bill took over in 2001, the business was estimated to be worth $135 million. Hearn, center, with the Christian pop band Newsboys. EMI broke up in 2012, and the Contemporary Christian Music Division became Capitol Christian Music Group. Still run by the younger Hearn, Capitol Christian Music Group's mission is "to impact popular culture and resource the church through music and music-related content and services consistent with a Biblical worldview." The tension between the ideals of selling a product and spreading a message continue. Artists currently signed with the label include some of the biggest acts in Christian music: Hillsong United, Chris Tomlin, Matt Redman, David Crowder, Britt Nicole and Newsboys. Hearn spent his later years in Nashville. His wife died and he committed to raising millions in the cause of fighting cancer. He also supported the city's symphony. Despite Baptists' traditional disapproval of alcohol, Hearn became a wine connoisseur, with a well-stocked cellar and a favorite sommelier. "Many people in Nashville's charity and society circles knew him as a generous, wine-loving philanthropist," reports Brad Schmidt of the Tennesseean. Hearn would have been 86 this month. His funeral is planned for April 25 at Brentwood Baptist Church in Nashville, Tenn.